Our first question is this: if you don’t know where you want to go, how do you ever expect to get there? Quick Draw Payroll in Medina thinks about financial planning like a road trip. Most people plan a trip by choosing the city they are visiting, booking a hotel, and allocating funds for travel expenses like fuel and food. So why do people not do this when they are planning for their future? We’ve come across a number of excuses while helping clients plan their financial future. 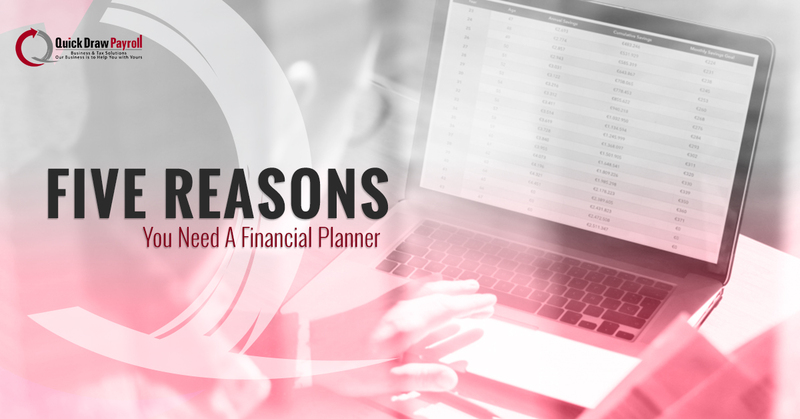 In this post, we’ll share the top five reasons why you need a financial planner. If you’re ready to work with us, please feel free give us a call! We like to ask our clients: how much are you saving? It’s important to understand that spending money is how you lose it. So, at a fundamental level, we want to ensure that our clients understand the importance of saving before we move into investments and beyond. Allocating money to savings monthly is a great first step to planning your financial future. Once we finish discussing how you save your money, we want to address how your money is working for you. Do you invest it in the stock market? Are you reinvesting into your business? You want to make sure money that’s sitting around is working for you to make more money. What happens to your finances after you have passed? It’s a tough question to consider, but it’s important to determine what will happen to your money in case of an unfortunate event. Don’t make things worse for your family by having failed to properly manage your money. Do you have proper life insurance to cover your needs? What about short and long-term care disability insurance? With the cost of long-term care skyrocketing, you need to be covered. Why do we mention this when it comes to financial planning? Your money is paying for the policy to cover you and your family in case of a moderate to a serious accident, leaving you unable to work. If you’re like most Americans, you’re employed by someone. Are you taking advantage of your employee benefits? It seems like a silly question to ask, but a tweak here and there to your benefits could mean the difference between less-than-sufficient coverage and the best coverage possible. Does your company offer insurance? Do you receive other benefits in addition to sick leave, overtime, and the like? It’s all a part of the web that is financial planning. If you’re in need of a financial planner, you’re not alone. It’s responsible to seek out help in managing your money and your future. Whether you’re interested in business planning or personal funds, give us a call today! Quick Draw Payroll has been serving Medina and Bandera for years. Our mission is to help you with money to make your life easier.